In a world of on-demand streaming services, it’s easy to forget that some people still really like owning a downloaded or disk version of a movie, and for anyone with a huge library, Movietag could prove incredibly useful. The interface is straightforward, and once you have an account, adding movies in your collection to the platform and tagging them is as easy as pie. Just search for them using the bar at the top of the screen and then select from the list that appears as you start typing. It’s all pretty slick. Once you’ve added in your downloaded, DVD, Blu-ray or other format films with appropriate tags they’re easily sortable, and appear in a list on your main account page under the tags you’ve created. In this sense, tags are more akin to ‘categories’. Don’t worry if you end up with a huge number of tags – they’re also searchable, so you can always find the one you need in a pinch. 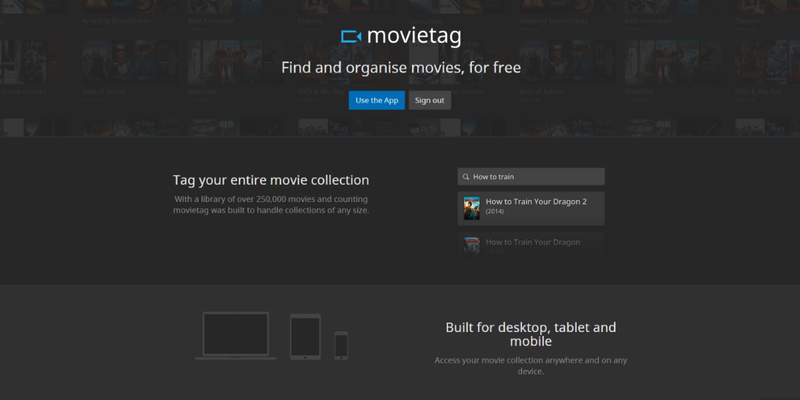 For people who rarely watch movies, Movietag probably feels like overkill, but for anyone with an expansive collection, you’ll know how easy it is to lose track of what you own and what you haven’t seen yet. As well as helping you organize movies into categories, you can mark them as public or private – so you can keep anything embarrassing away from prying eyes. However, Movietag is by no means perfect, and depending on how you use it, might not make any sense at all. For example, the demo account on the website uses categories like ‘Best of Comedy’, ‘Best of Animated’, ‘Own’ and ‘Watchlist’ – but it might not really make sense to have to remove the ‘Watchlist’ tag once you’ve seen something and add it to another category. It also means you’ll have a collection of movies spanning different genres here that you’ll need to re-tag later. I like the option of having a watchlist – it just might be best logically served by a tag, rather than its own section. Each category page shows you all the movies tagged within and a star rating system underneath, in case you can’t remember which movies you really liked and which ones you’ll probably want to avoid in future. Clicking through to an individual title shows you a synopsis of the movie, release info, cast and crew and review information (where applicable). For anyone that likes to manage their collection on the move, the platform works well from a mobile or tablet too, allowing you to view titles as a list rather than as tiles. Overall, it might only appeal to movie buffs or people with huge collections to keep track of but Movietag is a simple, free way to cut down the ‘what shall we watch?’ discussion – and that’s priceless.